The mechanical engineering major at Anderson University teaches the principles and skills necessary to understand how heat and mechanical power can be used in the design and operation of machines and other tools. Graduates of our program develop skills that can be transferred to other areas such as Chemical Engineering and Materials Science. How can I get involved in the Mechanical Engineering program? 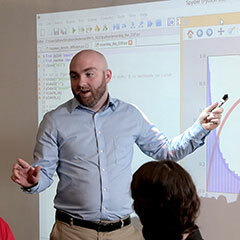 Among the 83-hour major, students take courses in math, science, and engineering in order to learn how to solve the complex technological problems that face society. The Mechanical Engineering curriculum provides a broad background in the different areas of the discipline such as heat transfer, machine design, control systems, and manufacturing finance. Additionally, students will have an opportunity to discover the various specialty areas of the major through different elective courses including fracture mechanics, machinery dynamics, and applications to the aerospace industry. Full list of courses required for the Mechanical Engineering Major. With a degree in Mechanical Engineering from Anderson University, students will be well prepared for productive careers in industry, government, education, or for graduate study. Graduates of this program will be given a solid background in the theoretical and applied study of Mechanical Engineering, having been exposed to various techniques and instrumentation. Students will also have the opportunity to expand their creative abilities through design courses that challenge them to engineer products with cost and resources in mind. Whether the product is to be deployed in rural Africa, or is being developed by a small start-up firm, materials and cost are becoming increasingly important. The ability of engineers to “be creative with less” is more essential than ever.